I’m used to driving in the West. Long stretches of empty Nevada roads, the Pacific Coast highway, and FREEways make road tripping through the west gorgeous and easy. I was a little out of my comfort zone driving through Philadelphia, Boston, and D.C. But after driving the wrong way down a one-way street in downtown Baltimore (down Lexington no less, to the tune of “giiiiirl, you so dummmmb”), I was ready to give up. Plus, we were headed to New York next. I wasn’t about to compete with crazy cab drivers, bikers, and buses. Even my anti-public-transportation traveling companion agreed that it was time to take the train. And the subway. So we stayed in New Jersey. Taking the Amtrak and/or subway into New York from Jersey isn’t for every traveler or every trip. When I mentioned my bridge and tunnel plan to my Manhattan-based brother in law he gave a slight shutter and backed away repulsed. But whatever. I liked staying in Jersey. Getting around New Jersey: Trust your GPS. Don’t look at a map, just blindly follow the directions. I had received this advice prior to entering the “Garden” State, but I still typed an address into my GPS, looked at the map, decided I could get there a better way, and promptly drove around in confused circles. Roads don’t connect where you think they do, and you can’t turn left anywhere in Jersey. So even if your GPS sends you on a six mile circle to go half a mile down the street, just do it. Getting to New York via Amtrak: I was pleasantly surprised by all the nice places to stay in New Jersey. New Brunswick was a cute town, as was Edison. We stayed at the Marriott near the MetroPark train station (120 Wood Ave, Islin, NJ 08830) and paid less than $10 to park there for the whole day. A roundtrip train ticket to New York Penn Station was $20. Tickets are easily purchased at a kiosk in the train station. You can check amtrak’s website for schedules, or you can just show up whenever you feel like it. Trains leave at least once every thirty minutes. The train ride is forty minutes long. Getting to New York via subway: Yet there is a cheaper way to do things. On our last day in New York/New Jersey, we were planning on heading up to Boston that evening, so we changed our traveling strategy. After checking out of our New Jersey digs, we drove up to the Bronx and for $11 we parked at Putnam Gardens Parking (3815 Putnam Ave West, Bronx, NY 10463) which was two blocks away from the Van Cortlandt Park subway stop (Line 1). Then for just over $2, we took the subway into the city. The ride down to Wall Street took just over an hour. I wasn’t quite as comfortable as the train, but when you start at the northernmost stop, you are pretty much guaranteed to secure a seat on the subway. Besides, any ride is more comfortable that frantically pulling a U-turn across a crowded one-way street in Baltimore. On September 11th, 2011, Barack Obama recognized New York’s newest monument. First time visitors to New York, those who come to the city often, and residents have since been lining up to see the memorial. 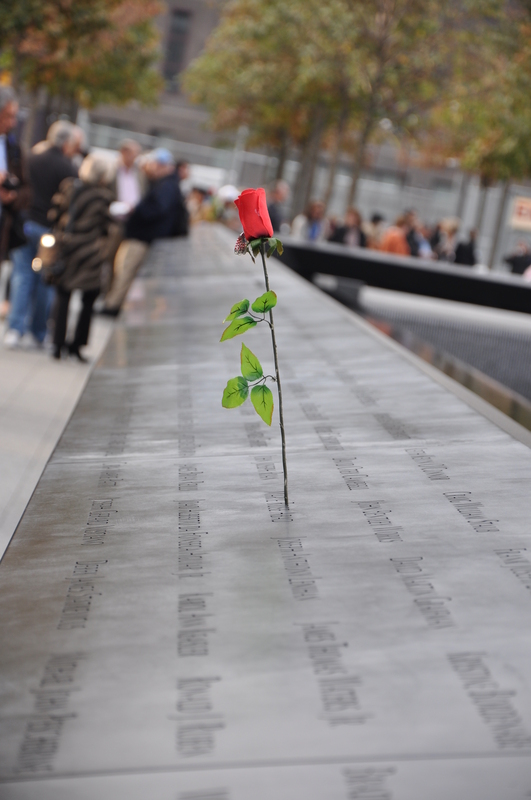 Visiting the National September 11th Memorial takes some planning, but it’s well worth seeing. 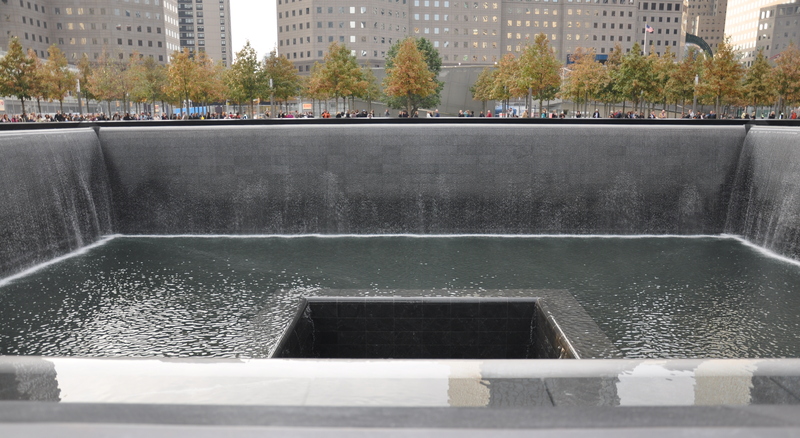 The Memorial consists mainly of two infinity pools that are situated over the cores of the two Twin Tower foundations. The water runs down the edges of the monuments, waterfall style, and then cycles back up to the top. Around the edges of the pools are the names of all 9-11 victims. The names are not engraved like on the Vietnam Memorial, but instead the letters of the names are punched clear through, so people can leave flowers, flags, or notes standing up right on top of the memorial. The memorial is simple, which makes it all the more moving. Besides the two infinity pools and tree-lined walkways, there is a museum which is slated to open in 2012. In order to get into the Memorial, visitors have to reserve tickets on their website. Do this a several days in advance. I got online on a Friday and the first set of tickets that were available were for the following Monday at 4:00. If you plan on visiting on a Friday, Saturday, or Sunday, reserve your tickets at least two months in advance. My friends and I ended up staying in New York an extra day so we could see the Memorial on Monday. Tickets are free, but donations are accepted though the website. Once securing tickets, they can be printed at home or picked up via a self-service kiosk in the Visitors Center at 90 West Street (the corner of Albany and West). The Visitors Center is very crowded and serves as mostly a gift shop. There is a timeline of 9-11 events on the wall, but that’s about it as far as information goes. The Visitors Center is open daily until 8:30 pm. It opens Mon-Fri at 10, weekends at 9. Once printing out your tickets, head to the corner of Albany and Greenwich (near Wall Street). You have to show your ticket in order to get in line, and will not be permitted to line up more than 1/2 an hour before the time on your ticket. Once in line, be prepared to wait. We waited in line for a little over an hour before actually getting into the site, so plan accordingly. Security is pretty extensive, as can be expected. The website mentions that you need ID, although we were not asked to show ours. The Memorial was well worth staying an extra day, the hassle of securing tickets, and the long wait in line. It wouldn’t have seemed right to come to New York and not pay our respects.